A few of the mods brought to my attention that LaLD stands for ‘Live and Let Diecast’, not ‘Live and Let Dairy products’. My bad. I’ve been posting the wrong things all along. This 911 R should be alright, right? Lame jokes aside, here’s the one and only Spark model in my collection. Herr Quattro made you all envious (again) when he showed his GT2 RS for the quadrillionth time (he really likes to rub it in, doesn’t he? Annoying brat. ), so this is my weak attempt to upstage him. In some ways, you could say I have the edge. 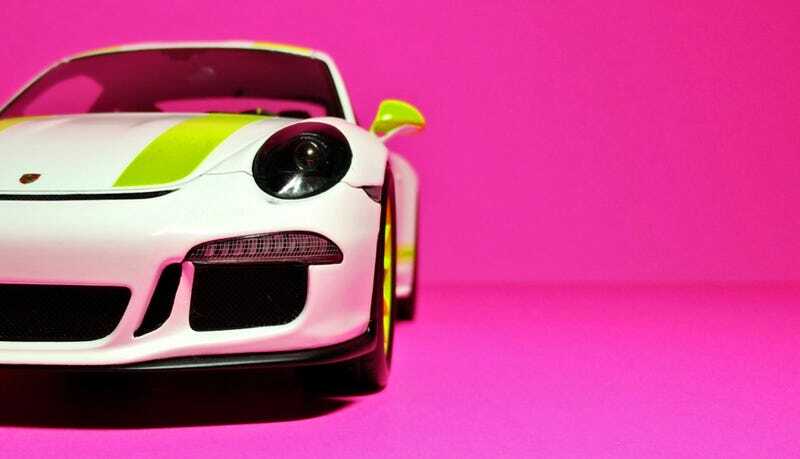 My Porsche comes in a sicker colorway, and I didn’t have to shell out three bills for it either. At one point in time, ck-modelcars had these on sale for 150 Euros which, of course, is how I ended up with the R.
The car sits a little too high, the wheels are a little too big, and the model is absurdly overpriced - the three traits of a true Spark model. Adding insult to injury, the detail isn’t much better than a GT Spirit or Otto either. Still though, they are usually the first to hit the market with the newest Porsche models/variants/special editions and have the most palatable colorways, proving that you have to be rich to taste the rainbow.